The 5K run/walk starts at 10 and the 16.5 mile ride begins at 11:00 am. The minimum donation of $30 to support Devon's brain cancer treatment. This can be paid on site or in advance. Info below. BBQ lunch. 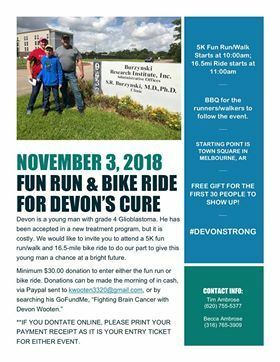 Bring your receipt as your ticket if you donate at GoFundMe, "Fighting Cancer with Devon Wooten."